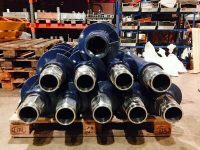 We supply a wide range of Sectional Flight Augers for the installation of Sectional Flight Augered piles (SFA) also known as Continuous Flight Augered piles (CFA). Typically used in firm ground when heave is a possiblity, but ground conditions will not allow the pile bore to stay open, to achieve a higher load capacity, or reduce vibrations caused by driven piles. For installing SFA augered piles. SFA Piles are installed by drilling into the ground with a hollow stemmed auger to the depth specified. As the auger drills into the ground the spoil travels up the flight and is removed once above ground level. Concrete or grout is then pumped through the centre of the augers as they are retracted, preventing the hole from collapsing. Finally steel reinforcement is inserted into the concrete pile to the required depth.